(23191.1, Governor Brad Henry Collection, OHS). HENRY, CHARLES BRADFORD (1963– ). Elected governor of the State of Oklahoma in November 2002, Charles Bradford Henry was born in Shawnee, Oklahoma, on July 10, 1963, to Charles T. and Audre L. Garrett Henry. Brad Henry attended the University of Oklahoma, receiving a bachelor's degree in economics in 1985 and a doctorate in jurisprudence in 1988. He also served as managing editor of the Oklahoma Law Review in 1987–88. He subsequently served as president of Brad Henry Oil Company, Incorporated, from 1987 to 1989 and as a private-practice attorney before becoming city attorney of Shawnee in 1990. Henry's wife, the former Kimberley Diane Blain, also a graduate of the University of Oklahoma, served as a classroom teacher for ten years at Shawnee High School, in history, economics, and government. She was one of five teachers in the nation to receive the 1999–2000 Close-Up Foundation's Linda Myers Chozen Award for Teaching Excellence in Civic Education. The Henrys have three daughters. 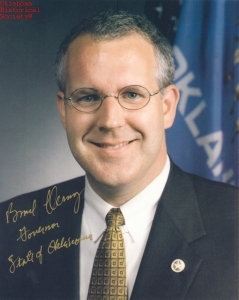 A Democrat, in 1992 Brad Henry was elected to represent District Seventeen in the Oklahoma Senate in the Forty-fourth Legislature. Reelected in 1996 and 2000, he served until his election as governor. During his tenure in the Oklahoma Senate he chaired the Judiciary Committee, and served as vice chair of the Economic Development Committee, and sat on the Appropriations Committee. Henry was inaugurated as Oklahoma's twenty-sixth governor on January 13, 2003, and was reelected to a second term. Almanac of Oklahoma Politics 2000, comp. Gary W. Copeland et al. (Stillwater, Okla.: OPSA Press, 1999). "Charles Bradford Henry," Vertical File, Research Division, Oklahoma Historical Society, Oklahoma City. Oklahoma Almanac, 1997–98 (Oklahoma City: Oklahoma Department of Libraries, 1997). Dianna Everett, "Henry, Charles Bradford," The Encyclopedia of Oklahoma History and Culture, https://www.okhistory.org/publications/enc/entry.php?entry=HE022.